By margreet riphagen, June 4, 2014 at 1:09 pm . 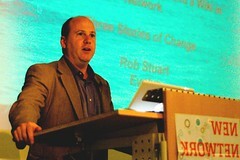 Rob Stuart is an activist based in Philadelphia. Here he gave an overview of some of his work, especially that which made use of new technologies. In this way he gave conference-goers some network practice to go along with the theory. His first case study drew comparisons between the railroad and the new media network. Railroad operators have traditionally been able to lay down the law, enabling movement for some while restricting that of others. An affordance of the new networks, on the other hand, is citizen action. A meeting between old and new occurred in Philadelphia, when railroad companies attempted to close off the Schuylkill River Park Trail. Rob helped create freetheriverpark.org, a campaign to keep Schuylkill open. The coalition was made up of a great number of disparate groups, each with their own character. Rob found that in order for the network to function, the groups needed agreement on goals, not necessarily on tactics. This, he suggests, meant that there was little in the way of internal conflicts. The group benefited from user-generated content and new technologies like webcams in its advocacy work, eventually succeeding in getting city officials on their side. A second case was accompanied by the question, ‘Can a citizen wiki help reform government?’ Reformballot.orgwas set up to restore credibility to Philadelphia local government, and increase citizen involvement in framing political issues. In 2 weeks, 59 proposals were submitted, which were then voted on by all of the site’s visitors. The top four were then written up for local politicians, and the experiment was considered a success on all sides. See here for highlights of the campaign.